1) What causes the lenses to cloud over time—is it UV exposure, chemical exposure or something else? 2) Is there something I can do to prevent, reduce or mitigate the cause of the plastic getting cloudy? 3) Since the headlight restoration product I use (Rain-X Headlight Restorer) acts like a mild abrasive, is there a limit to how many times I can use this product until I wear out or damage the headlight lens to the point where polishing will not work anymore? I have two newer cars in the family that have not shown any headlight lens clouding yet, and I would like to do what I can to avoid having to keep on polishing the lenses. What do you suggest? Doug: Great Questions. It is primarily the UV exposure that degrades the plastic lenses. When they are new, there is a coating on there that inhibits the exposure but over time, it wears off. The natural impact from sand and road grime does not help either. When we do the headlight restoration, we use three or four grades of abrasive with the final sanding being extremely fine (3000). We do the sanding with orbital pneumatic tools that run at different speeds. We then finish off with a polish that has a UV inhibitor. We have had good luck with this process, and it seems to last, so I am not sure why you have had to do them so often. I am sure the farther you sand into the plastic, the less effective it will be. The best thing you can do for the headlight lenses that are still in good shape is to keep them clean and waxed; this will help protect them as best you can. Taking the time or spending the money to clean up those cloudy lenses is well worth it. 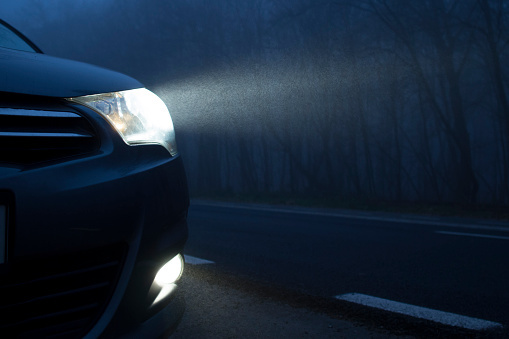 Not only will you have better vision at night, but it makes the whole car look much better.